TVB will welcome the upcoming Lunar New Year with the period comedy My “Spiritual” Ex-Lover<倩女喜相逢>, which is premiering on February 9. 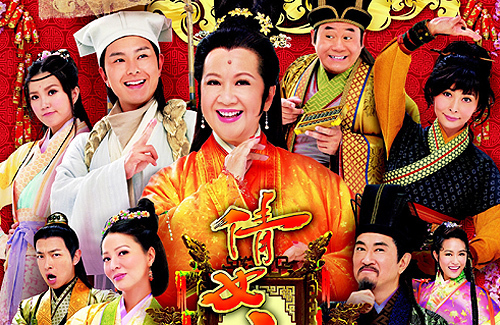 The 15-episode series stars Nancy Sit (薛家燕), Edwin Siu (蕭正楠), and the cast of 2014’s Queen Divas <新抱喜相逢>, including Evergreen Mak (麥長青), Joyce Tang (滕麗名), and Angela Tong (湯盈盈). Loosely based on the characters from A Chinese Ghost Story, a short story from the classical Chinese novel Strange Stories from a Chinese Studio <聊齋誌異>, the TVB drama tells the story of a poor struggling scholar Ning Choi San (Edwin Siu), who fails to pass his imperial examinations. Choi San has no choice but to seek help from Ying Chun Fa (Joyce Tang), the wife of his second elder brother Ning Choi Kwan (Oscar Leung 梁烈維). Chun Fa employs him and his stingy older brother Ning Choi Man (Evergreen Mak) in her lamp shop, where they work as artists. During this time, Choi San’s girlfriend Ying Chun Kiu (Jinny Ng 吳若希) would not stop pressuring him to get married. His father, Ning Bing Yan (Henry Yu 于洋) also falls sick. To earn fast money, the upright and honest Choi San has no choice but to use fraudulent schemes to promote the sales of Chun Fa’s lamps. He puts his family into complete chaos when he angers the celestial master Yin Chek Ha (Angela Tong) and fake fortune teller Do Man Jun (Ricky Fan 范振鋒). In midst, Choi San discovers that a mysterious female ghost known as the name of Nip Siu Sin (Nancy Sit) has been helping Choi San, but she causes more trouble than it is worth. I cant wait to watch this I like watch evergreen not so much of Oscar and why in the world would they pair up Joyce and Oscar Id always thought she would be pairing with Mak Bao??? What’s up with these odd pairing older woman with younger men dont seem right……. wow, i haven’t seen joyce for so long that i thought she’d left tvb. i’m not sure i want to watch this. i skipped Queen Divas last year and this looks similar. Ngo ka nin is not in? Wondering why he is not in? He is such a great actor. Maybe he was filming something else? Yay!! It’s chinese new year!! yah i like Nancy sit! looking forward! Nancy Sit is Siu Sin? This is going to be funny for sure. I’ll check this out for Ricky Fan. I recently saw him in ‘Officer Geomancer’ and want to see more of him. YAY!!! happy new year!!! looking forward to JINNY’s character soon!!!! Sounds cute! Looking forward to it. I didn’t really enjoy last few year’s lunar series.
. Moreover not pretty at all.